Dr O'Borman was born Jesús Brito Olvedo on January 25 1939, in Distrito Federal, son of Alfonso Brito and Ana María Olvedo. In 1961 he moved to Puebla to work as a waiter in a restaurant his uncle Luis Brito owned, and there he got close to lucha libre. General admission to Arena Puebla was 50 pesos back then, and he could afford it, but he wanted to be a wrestler and to get close to the wrestlers, so he carried the bags of the major stars of the era to get free. It worked for HHH. In 1963, at age 24, he started training in Puebla with Toro Salvaje. He started out wrestling as Ventarrón (Strong Wind), debuting on June 24, 1964 at the Cine Arena Hidalgo in Puebla, losing by DQ in the "especial" (third) match against El Buitre (the Vulture). 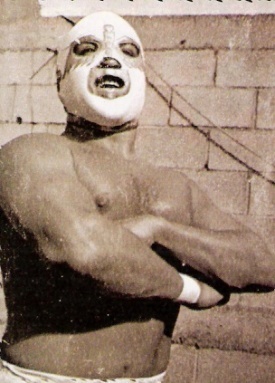 As a rookie he had the chance to meet his all time idol, El Santo, who encouraged him to work hard. O'Borman always said that really boosted his morale. As a rookie he wrestled in El Salvador and Honduras during three months, working every day and getting 125 pesos per day. This was brutal and said it would be the last time he'd ever leave Mexico. Soon he approached the local promoter with his desire to get a new name. He was offered Mr. Atomo, Murcielago Dorado (Golden Bat) and Dr. O'Borman - of course he chose the latter. His reasoning was that as he'd developed a very strong friendship with El Enfermero, a major star at Arena Mexico of the era, with the ready made doctor gimmick he had a chance to someday be his regular tag team partner. He developed a feud with Franco Colombo, who years later would become a maestro at Arena México, but unfortunately he injured his left arm. He came back six months later, and avenged himself by defeating Colombo in a "máscara contra cabellera" bout. But luck wasn't on his side, though, as in 1966 he injured one of his knees while training, causing him to miss three months of bookings. The first time he arrived to Mexico City to work, he was not on the level and Salvador Lutteroth Jr. wanted to send him back to Puebla. O'Borman literally begged him for a chance, so he was sent for three months to train daily with Rafael Salamanca at the Arena México gym. His progress was so big, that he became a minor name star at Arena Coliseo, working 39 out of 52 weeks at Arena Coliseo in a tag team with Bruno Victoria. During the 60s and 70s he had few appearances for EMLL's major arenas, but he was a star in the independent circuit and a main eventer in many of the smaller venues of the Mexico state area, as well as arenas all over the country including Tijuana and Ciudad Juárez. As a worker, he was a good hand, who could be used in supporting roles when the major stars from Mexico City came to town, and he could hang with them with no problems. He defended his mask 13 times, unmasking Turok, Doper (I wonder he he realized what his name meant), Zarco, Rubí, Cuervo, El Invasor, Agente X, Spiderman (in 1966; would later become Black Man) and Astral, and taking the scalps of Henry Romero, Tony González, Chamaco Ortiz (Hombre Bala/The Monsther) as well as Franco Colombo. One of his most memorable "apuestas" matches was his double bloodbath bout with Tony González - who bladed too deep and sliced a vein in his forehead. His favourite career match was a "mano a mano" with La Gacela, a young superworker who would later become famous as Black Terry. In early 1979 he left the EMLL network and became an "independent", having his last cup of coffee in the smaller arenas operated by Francisco Flores. He engaged in a feud with Solar I, who he had some great matches with, culminating in a mask vs. mask match that he lost on December 9, 1979 at the Palacio de los Deportes. He planned on retiring, wrestled a bit more and went into semi-retirement, usually coming back to develop feuds and lose hair matches, such as his June 12, 1983 loss against the masked As Charro at Arena Puebla. After that he promoted wrestling at Plaza Santa Cecilia during a few years. In 1995 he sold the rights to the O'Borman name to the current Dr. X, who worked as "Dr. O'Borman Jr." until December of 2000. Apparently somebody else, not related to O'Borman Sr., had registered the name years ago and had waited for him to become somewhat of a name to ask for a big price for the rights. He said no way, and changed his name to Dr. X.
O'Borman died on January 16, 2006 due to cardio-pulmonary complications. During his last years, as usually happens with most wrestlers of his era, he had terrible knees and could only walk aided by two crutches. As a kid, he always told his mother "I'll become a doctor and buy you a car". And he didn't lie.